1. Put the yogurt and 1 tbsp harissa into a large bowl, season and mix. Add the chickpeas and set aside. In a small bowl, mix 1 tsp harissa, 1 tsp oil and 1 tsp juice from the lemon jar to make a dressing. 2. Add 2 tsp oil to a pan, then the courgettes. Fry for 5-7 minutes or until golden and just tender. Tip in the cumin and cook for 30 seconds till fragrant. 3. Fold the preserved lemon skins and parsley into the courgettes and check the seasoning. 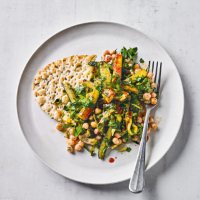 Tip the chickpeas onto a platter, mound the courgettes on top, then drizzle with the tangy harissa dressing. Serve with the flatbreads. Cook’s tip For something different, roast a pack of Waitrose Mediterranean Roasting Vegetables instead. Add the cumin with 5 minutes cooking time to go, then finish with lemon and parsley. This recipe was first published in Tue May 29 09:49:21 BST 2018.